Bose IE2 audio headphones set a new standard for sound reproduction that conventional earbuds can't match. Re-engineered from the inside out, they feature an enhanced acoustic design that helps music sound smoother and more natural. And our new construction provides a more secure fit and improved durability. IE2 headphones reproduce music with more range and realism than most typical earbuds. A modified port design, in concert with our proprietary TriPort acoustic headphone structure, results in a richer audio performance, with more detail in music's high frequencies. More clarity, even at louder volume levels-an overall presence you'd expect from much larger headphones. Proprietary StayHear silicone tips offer greater in-ear stability during exercise and other active sports. Advanced materials and design allow the tips to nestle inside the bowl of the ear while also naturally conforming to the ear's upper ridge. The tips come in three sizes to fit listeners comfortably for hours on end. StayHear tips also are designed to remain more securely on the headphone itself. Overall, they provide a better on-the-go listening experience. IE2 headphones are sturdier than ever, thanks to advanced materials, construction and manufacturing techniques-all adding up to more lasting quality for you. Each pair undergoes rigorous testing to meet Bose standards for performance and durability. 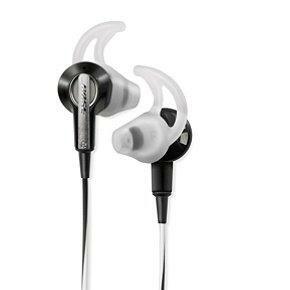 Bose IE2 headphones are engineered specifically for listening with MP3 players, laptops and portable CD players. The cable's angled plug fits directly into sources with recessed headphone jacks. Also included: a sleek, protective carrying case with room for a portable MP3 player, plus original-style tips in three sizes. Sound is clear, feels very comfortable while using them. Unfortunately destroyed by my friend by putting it inside a washing machine. They're earbuds with funky tips. They have a funky black and white wire and they're decently popular. Initially they appeared as good earbuds with a very consumer-friendly sound. The build quality is very poor. It's made from cheap plastics which tend to break under ANY level of impact. Parts of the bud can fairly easily shake loose leaving you with rattling noises whenever you move or lower frequencies are made. The tips are also made from a cheap silicone and tend to start to split and form fissures after regular wear and tear of a few months. These look slick. The spiraled black and white wire looks really cool, the chrome (or faux-chrome?) on the outside of the buds make them look cool and the weirdly shaped tips actually look quite natural in their translucent form. Simply put, the sound quality of these are decent. If you're moving up from your free earbuds that come with your phone, then these are fantastic. In fact, these are better than most things under $60. That said, you're paying the BOSE tax (similar to the Apple tax or the Beats tax) in which you're paying for the brand name. It doesn't perform nearly as well as any of the single-driver IEMs which run a similar cost. At best, they sound about as good as the beats earbuds. This sound signature is so sculpted you might think it was made of clay... In all seriousness though, it is incredibly unnatural. Huge bass boost with upper-range equalization as an attempt to minimize upper-end rolloff. All of this to find yourself listening to earbuds that sound a lot like Beats Solos. Decent headphones but bad for the price. open and good soundstage, bassy. wear is quite comfort and does stay on your ears firmly as suggested by Bose. Warm and easy listening. Pros - Soundstage is guite airy, open and dynamic. Good amount of bass for pop or rocks etc. Innovative design. Cons - Zero isolation in public, lack sonic details, wired wearing application which probably won't suit a lot of people, pricely & low c/p ratio. wouldn't recommend if you're going to pay for $100 or above. Reasonable price should have been around $70. The only selling point is the open soundstage, would make a goid pair for movies or gaming. No way near audiophile in terms of sonic reproduction, however, the brand name might be able to impress certain people. Unacceptably poor isolation (tried all different sizes of silicon bud and wearing method). Bose IE2: Not So Good! Pros - Stability in ears; Nice case; Comfort. I paid for them around $140 here in Serbia and for the price I was disappointed. I chose IE2, when my Sony EX300 cables stopped working, because it was available in my god forsaken country Serbia where we don't have much choice except those highly commercialized brands as Bose. First that came on my mind is that there was a nice soft-ish leather-like black case, not huge but on the bigger side when it comes to in ear earphones cases which I found to be very useful since you don't have to fold cables too much. That was about everything that was good with these earphones. They just didn't sound good, first of all no isolaion at all, just like normal earbuds, while I expected it to have no real isolation (read several reviews and watched videos on YouTube of them) I didn't have an idea it would be so bad, since I got used to having the isolation on my previous earphones I forgot how bad it can be when there is none. Completely useless earphones in the loud gym, while riding bicycle because of noise and wind, completely useless in a loud bus... you get the idea! Sound was... well ok, not extremely bad but nothing special, it was on the same level (different sound but equivalent level) as let's say my 70-80$ EX300, which are double cheaper and have isolation. They lack a bit that lowest sub bass feel, mostly due to isolation but in general they lack it, but the bass is strong overall, especially for the earbuds with no isolation, not much to say about the highs and mids, not sibilant but nothing special. Those highly advertised StayHear tips (something similar became more popular with new Beats Tour v2) were ok, 3 sizes, easily torn apart (my mid size torn while I was taking it off the earbud to test the small one) but generally soft and comfortable and it stays secure inside the ear shell, better than other in ears that have cable down design but still worse than the ones with over the ear cable design. Still, complete lack of isolation was something that I should be aware of but didn't quite expect this bad situation. My advice is to avoid these at all costs, especially when there are so many choices in this price range that literally blows away these, even so much hated from the wannabe audiophiles Beats Tour are noticeably better than IE2. Friend paid 140$ for his Vsonic GR07 that are better in every possible aspect and it is not a matter of someones opinion. Don't get me wrong, they are still better than stock earbuds you get with your smartphone, but if you can, I recommend searching further for another option. EDIT: I just saw that worldwide they are around ~110$ now which makes them more saner choice, still there are a lot better options even at 110$! Decent sound but maybe a little overpriced? A little decent pair of In-ears, nothing to special and exciting about them. They sound decent for users who want to enjoy their music on the go such as exercise or other events. Offers a very dark sound with a large mid-bass hump. These never have sounded harsh in any way even on poor recordings with a really bright aggressive sound to them. They do however sound very veiled and muffled due to there darker and smoother sound. They lack detail and just sound really fat..
Pros - Comfortable, attractive look, perfect for sports. Cons - Too much basses, the audio quality doesn't convince me, thin cable, all plastic materials. Too many bass frequencies and as I said before, the audio quality doesn't convince me, bad trebles and mids, they're all made by plastic. The good side is that they're perfect for sports activities, because with the StayHear system the earphones doesn't drop from the ear, whether they're very comfortable. Great for casual listening, but nothing more. Pros - Comfortable, stable, and hiss-free on nearly any audio source. Cons - Meh sound, tangling cables, and no isolation. The headphones come with three pairs of StayHear™ tips (small, medium, and large), a shirt clip, and a carrying case. Shirt clips are always nice to have, although mine sadly broke within the first month of use. The carrying case, on the other hand, is unique, in the way that it’s meant to hold the IE2s and your audio player of choice inside, rather than just the headphones. The case was just a bit too small for my iPod Touch, though. I find the black and white striped cable to be an odd choice of aesthetics. It’s certainly eye-catching and lets everyone around you know that you have enough disposable income to afford a renowned brand like Bose, but it just doesn’t strike me as fashionable in the way that Beats by Dre is. When trying to stand out, black and white are not the first colors to enter my mind. But in the end this isn’t really much of a concern for me. For my experience, at least, build quality has turned out to be pretty decent. The 45 degree angled plug is great for relieving stress near the connector, and is something I would like to see more audio companies do. And while the way the cord constantly tangles is constantly irritating, the included shirt clip does help to alleviate this issue. Comfort seems to be one of Bose’s strongest points, and they stay true to that with the IE2. The StayHear™ tips are a unique and unusual design, but once you learn how they work (and figure out the right size for your ears), they provide an amazingly soft and stable fit. You’ll quickly forget their presence not only because they can be barely felt in your ears, but also because you’ll never have to worry about them falling out. You could literally spend every waking minute with these things on without any problems. Unfortunately, the comfort and stability the StayHear™ tips provide did not come without sacrifices. These ear tips don’t even try to form an acoustic seal in your ears, which noticeably affects the noise isolation and perhaps the sound quality, but most noticeably isolation. Bose clearly states on the back of the box that the IE2s are “Not designed for noise reduction”, but this feels like an understatement to me. There is no noise isolation to speak of here. Everything you hear with your unobstructed ears will be heard when you put the IE2 on (before you put music on of course). Being able to hear your surroundings has its merits, but on noisy trains and busy streets, I found it impossible to focus on my music. I tend to use these things at home more often now, even though it defeats the purpose of their portability. The lows aren’t necessarily weak, but the IE2 helped me realize that I’m a bit of a basshead. The mid and upper-bass are adequately textured and not too bloated, but sub-bass is rather weak. This gives the odd sensation of hearing the bass well but never really feeling it all that much. Bassheads should stop reading this review now and look elsewhere. The highs are also recessed, almost to the point of being veiled, darkening the overall signature. I’m still trying to figure out how I like my highs, but this is definitely not it. But at the very least, the highs won’t cause any listening fatigue here. The mids are probably the strongest part of the sound signature. I wouldn’t call it spectacular, but they are clear with a decent amount of detail and definition. I actually like how acoustic instruments sound with these headphones. The soundstage has a decent amount of width, but it’s lacking a bit when it comes to depth and height. Instruments are also separated well, although I don’t perceive much “air” between them. Overall, I believe that Bose was going for a smooth, gentle, and neutral sound that wouldn’t offend or tire out anyone. After all, if it’s comfortable enough to wear all day, shouldn’t you be able to listen to it all day? But to me, the result simply sounds dull and not quite as lively as the Bose marketing led me to expect. Bose caters to regular consumers rather than professionals or audio enthusiasts, and it shows with the IE2. The IE2 will satisfy most casual listeners, with its “better than iBuds” sound quality and unbelievable amount of comfort. For them, that will be enough to justify the $100 price. But like many others have pointed out, you can easily find better value elsewhere. Since upgrading to better headphones, I mostly use the IE2 for gaming on my Nintendo 3DS now, where audio fidelity isn’t as much of a concern. Pros - Great mids and highs, good fit. I originally bought these because my earbuds had came apart on a flight from Canada to Hong Kong. I love the Bose home theater products I have at home and saw a Bose store in the airport and decided to buy them. Initially I loved the sound quality but, as can be expected with Bose products, the price was quite high due to the name. The mids were clear and the highs weren't too peaky but the bass left room for desire. The lack of isolation really killed these for me though, since I listen to music most when travelling or walking and I would have to blast the volume to drown out external noise. Overall these headphones would be great if they were priced around $90 but you do pay extra for the name, and there are tons of better options in the $130 price range. They are good for listening to music in private areas, but I would not recommend these for any sort of travel. I have no idea why most of ppl in this forum seem to go against Bose headphones, I mean, they are not necessarily the best IEMs in this price range, but they are definitely the ones worth every penny you spend on them. First of all, they are not 100% designed for Hi-Fi uses, if you are trying to compare them with UE18pro or IE80, then you are probably not on the right track. If you look into their design and spec, you'll see clearly that, neither their response frequencies nor the impedance is designed for Hi-Fi uses. then, what's so good about them? What does Hi-Fi mean to you? for me, it's simply comfort and enjoyment of music. Being a professional company of great acoustics, I have to say that Bose has done a great job in their IEMs. The base you hear is not the strongest, but it still could make you feel your heart is popping out in every sec without any harm to your ear. the mids is a lil far away, especially for Soprano, which is kinda like a pity for them. Last but not least, they are very comfortable, I once fall asleep on a plane for 8 hours with them in my ears, and after that my ears did not hurt at all. Therefore, if you dun really care about the trebles, they are definitely a good deal.